I know a ton of you are dry shampoo addicts like I am, but there are still some of you who don’t get it. Why do I use it? For one thing, I spend a decent amount of money on my hair color and the less I wash it, the better my color holds. It saves my hair from blow drying too. My hair is overall healthier since I stopped washing it every day. Secondly, I like to sleep. To be honest, sleeping in longer is probably my biggest motivator in using dry shampoo. I still shower daily, I just don’t wash my hair. I’m lazy, not disgusting! Thirdly, sometimes, it’s just too much to do my hair from start to finish. 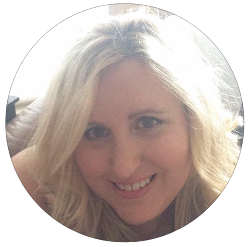 I am sure that sounds ridiculous to some of you, but sometimes I am just not in the mood to start the process of styling my hair from wet head to finished product. I just don’t always have that much time, especially in the morning. I wasn’t blessed with the kind of hair that can air dry or even just get blown dry and be presentable, so it’s the whole she bang every time. And lastly, I like my hair better with some texture to it. There’s no frizz, it holds curl better, its smoother if I want to straighten it, just overall easier to style on day two or three, than day one. I don’t know about you, but I love using dry shampoo! Prior to it becoming available everywhere, I used baby powder and I have to say, I didn’t love the smell. It’s great on a baby, but not so much in your hair. Plus it was super messy and ended up everywhere. Fast forward to the era of dry shampoo, I’ve used a ton of different brands and now feel I’ve narrowed it down to the best of the best. Without further ado, here are the best dry shampoos! 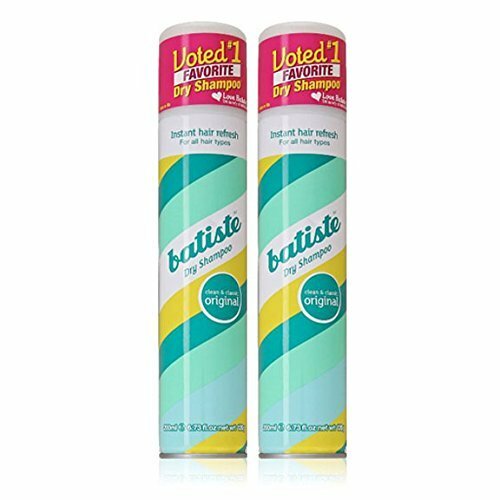 I mentioned this one as a fave product before, Batiste Dry Shampoo. It’s easily applied, available everywhere (Amazon, Ulta). Comes in many different scents and has special versions for brunettes and blondes. I like the tropical and the original clean and classic scents, but over Christmas, I bought a trio of travel mini’s that are all different scents, so I might end up with a new fave. How do I use it? 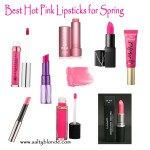 I shake the bottle, spray a couple squirts into my part and underneath my layers and let sit while I do my makeup. I usually come back to it after I apply my foundation and brush it through a bit (depending on how I am styling my hair that day) and hit it with the blow dryer and a round brush. It honestly looks like I had a blow out after. Then, I style as usual. If I am in a huge hurry to run out the door, I spritz my part and sides and underneath, fluff a bit and head out. Super easy to use, smells good. Can’t go wrong with this one. I went from using baby powder to Oscar Blandi Pronto Dry Shampoo originally. I still love it and use it off and on. It’s a powder formula with a narrow tip on the bottle, which allows you to flip through your layers and squirt the powder on your roots. You then need to massage it lightly into your scalp. It immediately makes your hair get a ton of texture and I think it is best used on pretty dirty hair. I usually recommend this stuff to people who work out and don’t want to wash their hair in between. It’s more absorbing than Batiste due to its consistency. You can buy Oscar Blandi at Sephora or Amazon. It has an okay smell, not offensive, not my fave, but definitely better than baby shampoo. It’s super easy to transport in your travel bag or purse. I would think it might be hard to use if you had dark hair, but since I don’t have dark hair, I can’t confirm. It does help with dark roots though by lightening them a bit, which is a plus over Batiste. One huge pro is that while small, the bottle lasts forever! A solid choice if you prefer a powder consistency in your dry shampoo. Tons of people love the scent of Dry Bar’s dry shampoo. I personally do not and found it a bit overwhelming to use in the morning. It was super strong to me at least. If the scent doesn’t bother you, it works pretty much the same as Batiste, it’s just more expensive. I used it the same way I did Batiste as described above. I don’t usually recommend this one, but I know many people who swear by it. 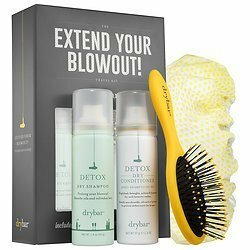 When I bought my Dry Bar shampoo, it came with a sample of their Detox Dry Conditioner (see kit above). I honestly thought dry conditioner seemed like a gimmick and wasn’t even going to try it, but I did and loved it! 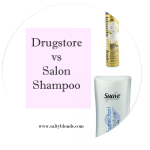 If you are a regular dry shampoo user, you will know what I am saying, when I say sometimes, if you dry shampoo several days in a row, your hair tends to feel a bit tangled and weirdly textured. Spray some of this Detox Dry Conditioner on your ends and it is gone. It is amazing how it completely changes your texture. It helped me detangle and smoothed out my ends and overall I loved how my hair felt. I’m still using my sample and am debating whether I would buy it again. I don’t use it often for one. If I had longer hair, it would be a resounding YES, but since mine is mid-length, I can’t really make a strong case for needing it. Would definitely recommend for those with long hair! 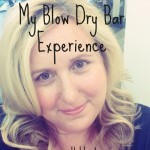 also recommend buying a Dry Bar Kit, like I have shown above, to try out a couple of their products since they are more expensive. 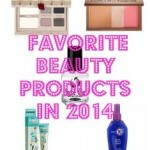 You can find Dry Bar products at Sephora or Amazon. 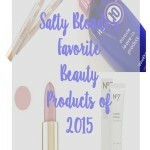 Do you agree with my picks for Best Dry Shampoo? I’d love to hear your thoughts in the comments!